Choose suitable varieties. California's Central Valley weather is most noted for its hot, dry summers. 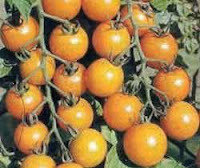 Good choices for this climate include Ace, Ace 55, Better Boy, Burpee VF Hybrid, Celebrity, Lemon Boy and Early Girl (all main season tomatoes). Beefmaster, Big Beef, Supersteak and Whopper (big-fruit varieties). Juliet, Roma VF, Viva Italia and San Marzano (paste tomatoes). Patio Hybrid, Sweet 100, Sweet Million, Sun Gold and Sun Sugar (small-fruit varieties). All of these varieties were taste test favorites, in trials conducted by the Master Gardeners of Sacramento County and here at Hoffman Gardens. Heirloom tomatoes, varieties that were around before the 1950's, are gaining popularity. Although they may not have the built in disease resistance or high production of modern hybrid varieties, they make up for it...with outstanding taste! Among the heirloom varieties you might want to try: Brandywine, Old Brooks, Arkansas Traveler, Dad's Mug, Anna Russian, Aunt Ginny's Purple, Dr. Lyle, Dr. Neal, German, German Johnson, Mortgage Lifter, Pruden's Purple and 1884. Two good performers for me the last couple of seasons have included Striped German and Orange Jubilee. 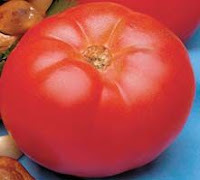 Catalog seed sources include the Tomato Growers Supply Company and Totally Tomatoes. Using home-saved tomato seeds. If you want to save seeds of a particular tomato variety, remember that many varieties are hybrids; they may not necessarily come back with the same traits as the tomato you enjoyed last season. Open pollinated or heirloom tomato seeds are fine for saving, as long as they are grown at least 30 feet away from any other varieties. For best results: save the seeds from tomatoes that are overly ripe; rinse off as much of the flesh and protective gelatinous coating from the seeds as is possible. Then, soak the seeds in a jar of water for a couple of days to remove the rest of the coating. The seeds will sink to the bottom, the gel will float. Discard the gel, remove the seeds and let dry on a paper towel. Then, store in an airtight container in a cool, dry location. Start seeds in late winter. February and early March are the best months for starting tomato seeds. This will allow 8-12 weeks for the plant to get off to a good start in a warm, sunny place, such as a south or west facing window. It usually takes 7-14 days to germinate tomato seeds. To test for viable seed that you've been saving: moisten a coffee filter, and place a few seeds in the filter, with space between the seeds. Place the filter in an old yogurt container, cover it, and place in an area out of direct heat. Check every few days to see if seeds have sprouted. Give seeds a healthy start. Use a light, quick-draining potting mix. Commercial seed-starting potting mixes are available; or, mix your own, using 4 parts compost, 2 parts peat moss, and 1 part each of vermiculite and perlite. Any small container with drainage is OK for starting tomato seeds. Fill containers about 3/4 to the top with the potting mix. Water, let drain. Plant seeds shallow, no deeper than 1/4 of an inch. To hasten germination, use a heating pad designed for seeds, such as a propagation mat. This will warm the soil to 70-75 degrees, which tomatoes need to germinate. Keep the soil mix moist. To prevent emerging seedlings from bending too much toward the sunny window, rotate the pots a quarter turn each day. If you are using grow lights, position the seedlings about 6 inches from the light source; keep the lights on 15-18 hours a day. Movin' on up. When two or three sets of true leaves develop on the tomato seedling, you can transplant it to a bigger pot. This is especially helpful if you started your seeds in a flat or in a small peat pot, or the young stems are bending toward the light at a sharp angle. When transplanting to a bigger pot (preferably a 4-6 inch pot, but no larger than a one gallon container), prepare the new pot the same as before. However, don't fill the pot as full. Place the tomato seedling, with as much of the original soil as possible to avoid disturbing the roots, into a 1/3 to 1/2 filled pot. Then, add moistened soil mix all along the stem, up to the bottom set of leaves. If you are growing tomato seedlings in a flat, thin them out so that there are six inches between plants. This will lessen the chance of root entanglement and damping off, a fungus disease that kills young seedlings. Help your tomatoes develop a strong stem by running an oscillating fan nearby, on low, for about 10-15 minutes a day. Timing is everything. Acclimate any indoor-grown tomato seedlings slowly to their new outdoor home; this lessens the shock to the plant, allowing it to grow at a quicker pace. About 10 days before setting out into its permanent garden home, place out during the day in a shady or semi-shady location; bring plants in at night. Mid-Spring is Tomato Planting Time. 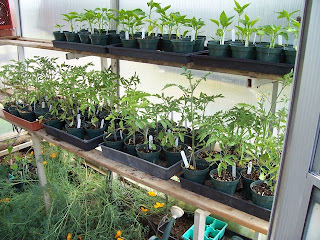 Plant tomato transplants when the soil has warmed enough to keep the plant actively growing. 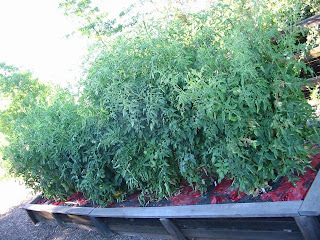 In most of California, mid-April through early May is the optimum time to set tomato plants outdoors, unprotected, in a garden area that gets full sun. If you can't wait that long, protect those tender young plants with hot caps, row covers or "Walls of Water" - plastic, cone shaped enclosures that are filled with water which collect heat during the day, slowly releasing the heat at night. One criteria for determining when to plant tomatoes outdoors: wait for the overnight low temperatures to be consistently in the 50's. Plant deeply. 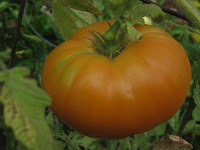 Place the tomato deep into the soil, clipping off the lower leaves and leaving only the top leaves and branches exposed. This will cause more roots to develop along the stem, speeding development. Mulch? Yep! Surrounding your tomato plants with three inches of an organic mulch beneath the plants helps moderate soil temperature, reduces water evaporation, controls weeds and helps to feed the soil as it breaks down. 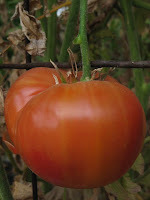 Some gardeners use red plastic mulch beneath their tomato plants. 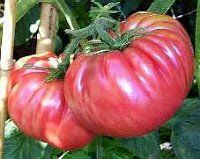 A couple of university studies have shown that this can produce an earlier, bigger crop of tomatoes. Other studies indicate that the reduction of light spectrum that results with the use of red plastic mulch may stress the plant into producing most of its fruit earlier in the season, with reduced production in the late season. Your call. Stake, stake, stake. 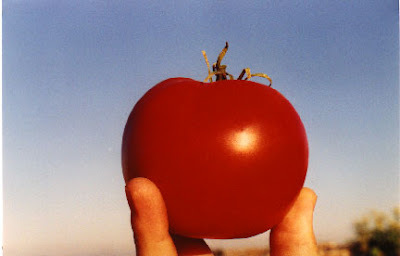 Supported tomato plants produce more fruit and are subject to fewer problems. 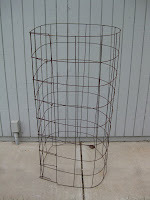 One of the best tomato support systems that can be used repeatedly for a number of years include "cages" made from concrete reinforcement wire. 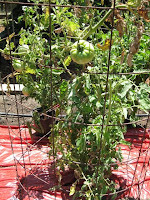 A 50-foot roll of this six-inch mesh, five feet-high wire can be cut to make about a half dozen tomato cages, each with a diameter of two to three feet. The six inch mesh allows for easy access at picking time. Stake and tie the cages to the ground, with one stake on either side of the cage. Water carefully. Tomato plants like water on a regular basis, deeply, once or twice a week. Soaker hoses or drip irrigation work best. 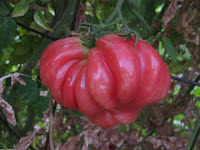 Regularly scheduled deep watering reduces plant stress, one of the causes for that mushy, black or brown discoloration on the bottom of tomatoes, called blossom end rot. Fertilize regularly, but sparingly. Lightly feed the plants every other week with an organic fertilizer that lists vegetables on the label; or, use a synthetic, low-dosage balanced fertilizer (10-10-10 or less, for example). Use half the recommended dosage when applying the fertilizer twice as often as the suggested intervals. This light, but more frequent feeding is especially beneficial for tomato plants in containers or quick-draining raised beds, where fertilizer tends to get washed out more often. Pick, pick, pick. Don't let the fruit overripe on the vine; pick when fully firm and red. 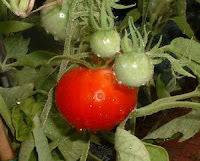 Hand picking is also the most potent control for mature tomato worms. If using chemical products, make sure the label states that hornworms are controlled by the product. Also available for hornworm control: a bacterial insecticide containing Bacillus thuringiensis (Bt). If you spot a tomato horn worm with a patch of white on its back, let it be. Those patches of white are the eggs of the parasitic trichogramma wasp that eventually will do the dirty work, eating away at the host tomato worm. 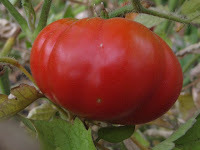 Determinate: Tomato plants whose vines make little or no growth once fruit is set. Most of the fruit develops at the same time. A desirable trait for those wishing to can or process their crop. Indeterminate: Vines keep producing new shoots, blossoms and fruit throughout the growing season. 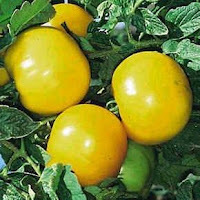 V: A tomato variety with this letter listed after the name is resistant or tolerant to verticillium wilt. F: Tolerance to fusarium wilt. T: resistance to tobacco mosaic virus.